This economy we ruined. These wars we didn’t end. These deficits we created over 8 years. How dare this President not fix everything immediately! When Mitt Romney realized he could only get the Republicans behind him by being George W. Bush’s biggest apologist, he must have known that would make him look like a fool. How could he defend going around the world blaming everything George W. Bush did wrong on President Obama? It’s a blame Roosevelt for inheriting Hoover’s economy strategy. Who would buy such steaming, gelatinous bullpuck? Fox News and people who got fat Bush tax breaks that’s who. If you’re in the middle class, you could maybe afford a hood for your Geo Metro with your Bush tax break. Guys like Mitt Romney could buy a Geo Metro factory. You can’t trust too many people who get tax breaks 10X the size the median American salary to vote for higher taxes. But who else would blame this President for everything Bush did YET give credit for Bush for anything good that happens (like this President making the historically brave decision to bet his presidency on going into Pakistan to get bin Laden)? Steve Benen thinks most Americans would have laughed at you for making an argument against like this against Roosevelt in 1936. But in 2012, the people who got fat Bush tax breaks have amazing ways to spread their messages. All they have to do is tithe a fraction of their tax breaks to Karl Rove—a guy who only blames Bush for exactly one thing: breaking his heart any time he saunters out of a room. No one is apologizing for America. ALL sensible Americans apologize for George W. Bush. It’s an insane argument that requires careful narrative structure. First it requires you to identify America with George W. Bush. Then trying to fix the problems that George W. Bush left seems almost unpatriotic. 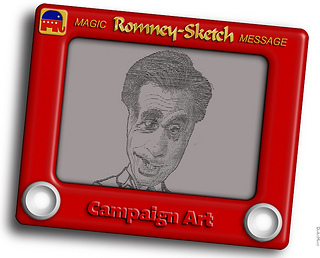 Now Romney is in the second chapter of his strategy to blame the President for the crises he inherited. Yesterday the Mitt Romney made an appearance at a factory that closed during the Bush Administration to attack the President. In Ohio, Romney is forced to admit that the economy is getting better. The unemployment rate is now as low as it has been since October 2008. You can’t blame this president if the unemployment rate is lower than he inherited, unless that’s your only hope. Mitt Romney wants you ignore the heroics it took to save this economy and blame this President for not making like totally way better. The governor who was 47th best at creating jobs wants you to believe that by simply following Paul Ryan’s 1-step plan to punish poor people everything would have been totally better. Believe him. He’s rich. His wife had choices! Romney has to use that frame in hopes that people people will not compare their personal economies to what was happening in 2008. 401ks crushed; 800,000 jobs gone each month; no hope that markets wouldn’t just crumble to zero and go away. Those dog days are over. But we can’t forget how far we’ve come. This President’s achievements—expanding Medicaid, Medicare, ending pre-existing conditions, ending Don’t Ask, Don’t Tell, saving Detroit, reforming student loans and bringing Elizabeth Warren’s Consumer Financial Protection Bureau to life—are inspiring achievements that will be missed sorely if lost. Don’t let ANYONE, even progressives, minimize them. There’s a still a huge risk we can go right back to George W. Bush’s America. And if that happens again, we have no one to blame but ourselves.